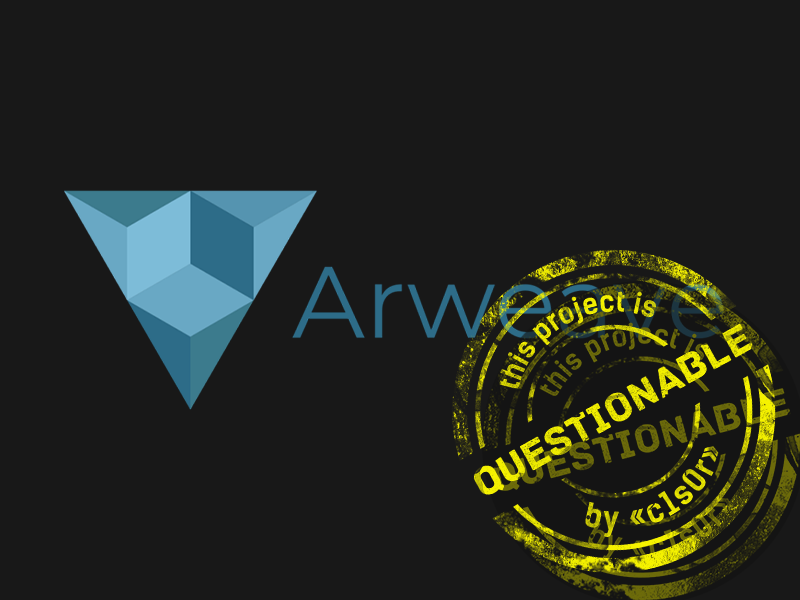 Here is an update with answers from the Arweave team. We did not receive a reply in their Discord. Their team member in Telegram was helpful, but It took a while to get the answers, and so we are publishing the answers we received so far. distributed - wow, really? Distributed app on the blockchain? No way! cheap - so how will they make money? Just by cashing in via an ICO? So, the tokens that pay for storage are given as rewards to the miners (again there are a series of mechanisms to ensure that storage prices and rewards are reasonable, and reliable). So the project itself is undertaking the token sale currently as fundraising to support our running costs for the next few years, there are some tokens reserved (with appropriate lockups) if we wish to raise more funds for running costs in the future, which we could choose to sell. So the most basic logic of routing metrics on which every network is based (form local to the Internet) is now a "Self-Organising Network"? Seriously? Q: Document storage on the blockchain? Ok, let’s assume they are encrypted and the encryption is air-tight. BUT if they are openly stored - anyone can see them and use for their own purpose (like to get a credit or a car using your personal information). And what if the encryption gets broken or the key to the encryption compromised? What if quantum computers come online? Who will re-encrypt the entire blockchain to keep these documents safe? All this data will suddenly become exposed - permanently! Verifiable democracy - this is a pre-release idea that we've been working on ourselves - we'll be talking more about this in the future. Q: They don’t show percentages or even the mechanism of miner rewards. Just: "peers are financially incentivised to..." and that’s it. WTF? A: They are sharing this only with those who pass KYC since their sale is a private one. Not a scam - real people; working SDK. Still, even though the answers we did get make sense and clarify key concerns about the project - questions still remain, and their slow response is not encouraging.